In the oft-parochial world of audio, some good brands can go almost unnoticed. So it is with Gold Note: the Italian company commands a strong reputation in many parts of the world as a ‘stem to stern’ (or ‘soup to nuts’) brand, as it has products in every category from source components, to amps, cables, and tables, right through to loudspeakers and even record cleaning products. And yet, in other regions the brand remains almost unknown. However, within the plethora of products Gold Note produces, there’s clearly some deeper emotional investment in the analogue front end. Where other components in the line have catchy titles like ‘PA-1175’ and ‘A-3 XO’, the turntables and cartridges are named, which is why we are looking at the Giglio turntable and Donatello Red cartridge. OK, so the arm has the more prosaic name of B-5.1, but even in the nomenclature, it’s clear vinyl is more of a labour of love. 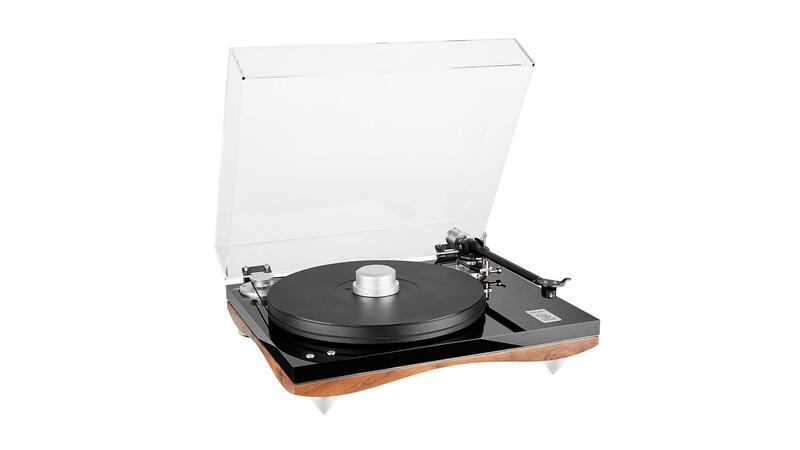 The fact Gold Note makes OEM turntables for many brands (the new Bryston turntable, for example) and has its own line in 180g LPs adds some credence to that statement. This is Gold Note at core. The £2,800 Giglio – and sister turntable Mediterraneo – are the latest additions to a seven strong range that runs from the affordable Valore models to the cost-no-object twin-armed Bellagio Black King and its “longest platter spindle ever”. In comparison, the Giglio looks positively restrained, but its curvy walnut underside is distinctive by most standards. Three large conical feet mean that the underside of the plinth is effectively on show at all times, which does look extremely attractive, but it’s more than just ornamentation as the plinth structure adds mass and rigidity without introducing excessive resonance. The plinth is in fact a composite of materials with a 3mm layer of stainless steel sandwiched between walnut and the black acrylic of the top layer. This sandwich construction allows the different materials to damp one another’s resonances and thus deliver a low vibration plinth as a whole. Having the curvy underbelly on show means the bearing housing is also on display, so Gold Note lived up to its name and gold plated the outer components. A mark of the overall design is the combination of shiny gold bearing, brushed metal feet, and a walnut and piano black platter, which all combine elegantly. This bearing accepts an 80mm spindle that has a threaded hole into which the centre screws and ‘clamps’ the platter in place (as there is no force involved, this clamp only acts to stop the platter coming off). The platter itself is made of Sustarin, a hard plastic that is used in gears and bushes and the top surface is ribbed – not ‘for extra playing pleasure’ but to act as a keyed surface for the separate gel mat supplied. Finally there’s a very light clamp that sits on the record.